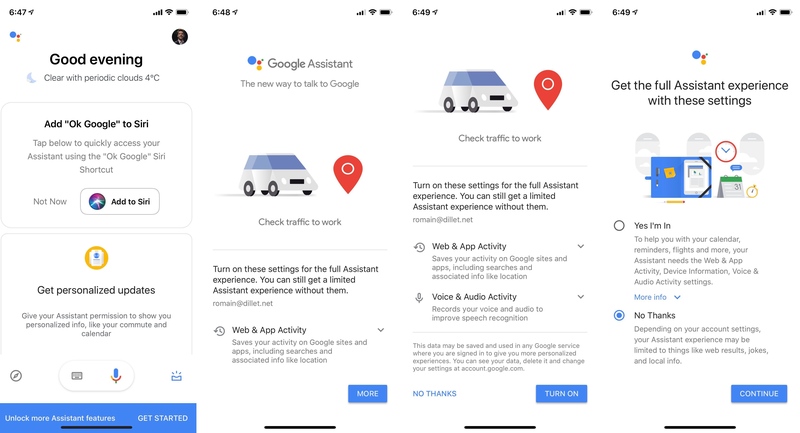 Apple probably didn’t intend to let competitors take advantage of Siri Shortcuts this way, but you can now launch Google Assistant on your iPhone by saying “Hey Siri, OK Google”. But don’t expect a flawless experience — it takes multiple steps. After updating the Google Assistant app on iOS, you need to open the app to set up a new Siri Shortcut for Google Assistant. As the name suggests, Siri Shortcuts lets you record custom phrases to launch specific apps or features. For instance, you can create Siri Shortcuts to play your favorite playlist, launch directions to a specific place, text someone and more. If you want to chain multiple actions together, you can even create complicated algorithms using Apple’s Shortcuts app. By default, Google suggests the phrase “OK Google”. You can choose something shorter, or “Hey Google” for instance. After setting that up, you can summon Siri and use this custom phrase to launch Google’s app. You may need to unlock your iPhone or iPad to let iOS open the app. The Google Assistant app then automatically listens to your query. Again, you need to pause and wait for the app to appear before saying your query. This is quite a cumbersome walk-around and I’m not sure many people are going to use it. But the fact that “Hey Siri, OK Google” exists is still very funny. On another note, Google Assistant is still the worst when it comes to your privacy. The app pushes you to enable “web & app activity”, the infamous all-encompassing privacy destroyer. If you activate that setting, Google will collect your search history, your Chrome browsing history, your location, your credit card purchases and more. It’s a great example of dark pattern design. If you haven’t enabled web & app activity, there’s a flashy blue banner at the bottom of the app that tells you that you can “unlock more Assistant features”. When you tap it, you get a cute little animated drawing to distract you from the text. There’s only one button that says “More”. If you tap it, the “More” button becomes “Turn on” — many people are not even going to see “No thanks” on the bottom left. It’s a classic persuasion method. If somebody asks you multiple questions and you say yes every time, you’ll tend to say yes to the last question even if you don’t agree with it. You tapped on “Get started” and “More” so you want to tap on the same button one more time. If you say no, Google asks you one more time if you’re 100 percent sure. So make sure you read everything and you understand that you’re making a privacy tradeoff by using Google Assistant.